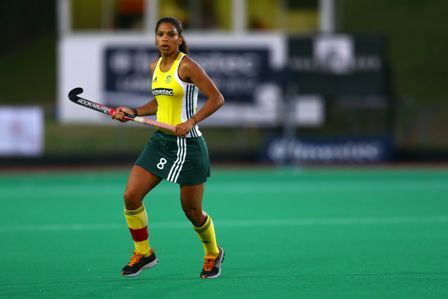 On Tuesday evening Marsha Marescia will take part in her 300th test match for the South African Womens Hockey side. To understand the magnitude of her achievement we need to put it into perspective quickly. The most capped Bafana player of all time is Aaron Mokoena with 107 caps, the most capped Springbok of all time is John Smit with 111 caps and Jacques Kallis has played 316 ODI games for South Africa. Marsha has already featured in 3 Olympic Games, 3 World Cups and 3 Commonwealth games and has been nothing but a great servant for South African hockey. “It’s the first time that I will be celebrating one of the milestones of my career in South Africa, so I am looking forward to the occasion in front of our home crowd,” Marescia said. Her fellow professionals have taken to twitter to express their support and pride for Marsha and the big occassion. John McInroy (The man behind Red Sock Friday), Rassie Pieterse, Alistair Fredericks, Jade Mckenzie Mayne, have all joined in to congratulate Marsha on her incredible feat. And we at All Things Jabu would like to pay tribute to the inspirational skipper too. Marsha thank you for the incredible heart you have shown for South Africa, we are proud to call you our captain. And although the day should be all about her, Marsha will happily take a victory over Ghana in South Africa’s first World League game against Ghana than all the fanfare over herself. At the same time, the Worlds leading goalscorer, Pietie Coetzee is on 248 goals and just two away from being the first player in World hockey to score 250 goals. Rank outsiders Ghana are very much an unknown quantity and tournament top seeds SA couldn’t have wished for a more ideal start to the five-country tournament that sees the top two qualify for the World League semi-finals in Europe in June. While the matches will not be televised in South Africa, fans can follow World League matches in real time at @World_League1 on Twitter. Tickets, which can be bought at the gate, cost R20 for adults and R10 for children to each day’s World League matches while a season ticket to the WL tournament is R65.